I’m happy to once again be a part of Eco-Libris’ Green Books Campaign. Today at 1 pm Est over 200 book bloggers around the world simultaneously posted reviews of books printed on eco-friendly paper. Pretty cool, eh? The books are as diverse as the bloggers, so make sure to take a peek at them. And to make it easy-peasy for you, here’s the link. Incidents of contamination of the food supply are featured almost weekly in the news. In Tainted , the clock is ticking to discover the source of the disease before it can spread, while navigating the political minefield of the hospital and the media. Once upon a time, all I read were medical thrillers and books about outbreaks. I would devour them, sometimes as many as four in a week. Then I kinda ODed on them and stopped reading them all together. In fact, it’s been a good three or four years since I read a real medical thriller. So I was all kinds of excited to read Ross Pennie’s Tainted, a medical mystery outbreak novel that takes place right here in Canada. And while I enjoyed it and I think it was a solid book, I wasn’t wowed by it. 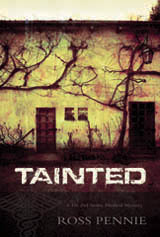 I really enjoyed the medical mystery aspect of Tainted. The science wasn’t too over my head, but it also wasn’t too dumb down. At first I thought the reason behind the outbreak was going to be pretty straight-forward, but man, was I wrong. While I didn’t see the ending coming, it wasn’t far-fetched and was totally plausible, which I really liked. Sometimes in medical mysteries the author pulls something out of left field that makes no sense at all. Thankfully that wasn’t the case here, at all. So, why was I so meh about Tainted? The characters. I just didn’t get a sense of who they were and quite honestly I didn’t care a fig about any of them. For me they weren’t written in a way that I could really feel a connection to them. I was often confused about their motivations and reasonings, even when it was being spelled out for me. I know that medical mysteries aren’t generally character driven books, but if I don’t care at all about ANY of the characters, then I’m not going to be a big fan of the novel. I also found the writing at times clunky with awkward descriptions. There was also a subplot that I thought was a bit out of place and poorly executed. I think if I had felt more of a connection to the characters I would have enjoyed Tainted a lot more. As it stands it was a decent medical mystery, but not one I was wild about. It’s a bummer that this book didn’t do it for you. I think that the mystery genre can be a narrow niche sometimes. I checked out this one mystery book recently, Mojo by Kris Sedersten, and it surprised me completely. I definitely have decided to give books in the thriller/mystery genre a chance. I’d recommend Mojo for sure.